Are you and outdoor enthusiast and need updated maps for your GPS? Do you also wish that those maps won’t ruin your economy? Consider yourself lucky, there are Free maps for Garmin at a few clicks distance! Go to http://garmin.openstreetmap.nl/. Choose the type of map you want, in my case Routable Bicycle (OpenFietsMap Lite) (new style), which is a biking map from the project OpenFietsMap that you find at http://www.openfietsmap.nl/. Screen capture from Free Worldwide Garmin Maps. You can in principle download an entire country, but this might be a very large file. You might choose to download data from the available tiles instead. To do that, you must first activate Enable manual tile selection and then you will be able to manually pick the tiles you need. Fill your e-mail address and click on Build my map. Screen capture of e-mail confirmation. Screen capture of download menu. There are several alternatives. In this example, we select the one that is made for uploading into the SD card of your Garmin device. Contents of the zip file with the OpenStreetMap data. Upload this file into the /Garmin directory of your unit. Then start your unit. Go to Setup -> Map menu and select OpenStreetMap as the base map. You might need to restart your unit. After these simple steps your Garmin unit will have the OpenStreetMap data available for navigating. 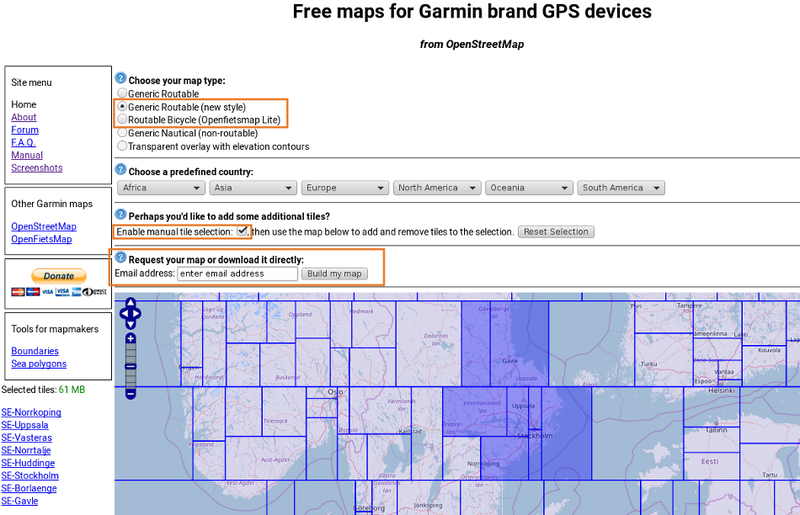 Navigating with the Garmin GPS and OpenFietsMap as basemap and data. Are the data incomplete? Remember that OpenStreetMap is a crowdsourced project. You may then go and complete the mapping yourself. Go on, download your data and enjoy the outdoors! There are way cheaper devices out there to do the same thing. Just take a waterproof/dustproof/shakeproof android smartphone for 1/5 of the price and install OsmAnd or MapsMe. Thank you for your comment. 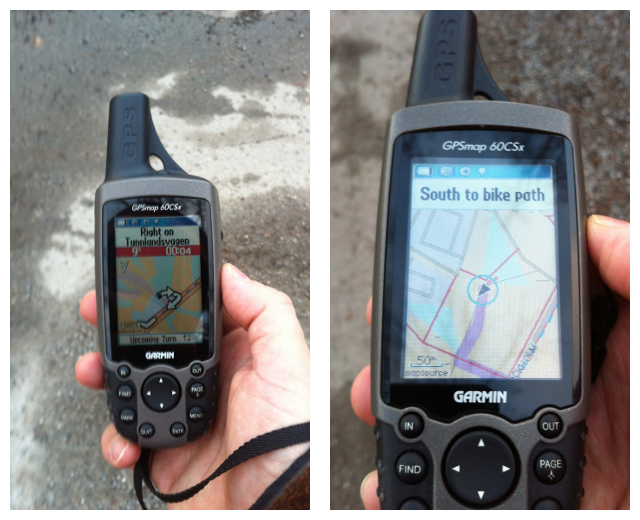 You are right, some mobile phones are cheaper than the GPS unit shown and you can easily can put OSM maps into those. I also have maps.me in my mobile phone and I think it’s great. No discussion about that. At the same time, you can also see that most cheap mobile phones are not made for many hours of outdoor use, since neither the phones nor their batteries are durable enough. On the other hand, a unit like the one displayed can work for over twenty hours uninterrupted with the same two rechargeable AA batteries, under the rain or in the cold. Mobile phones of comparable durability, tolerance to the elements and long battery time will not be cheap either. Hi, I just bought a Garmin 1030, I can succsefully load maps to the device and read them, but I can’t read them from the mini SD card, any tips? I created the Garmin folder on the sd but no luck as well. Thanks. Hi. Have you actively selected the Open Street Map background map in the map menu of your unit? You might need to do that, and possibly restart the unit after that. Good luck. Scientia Plus Conscientia by Hernán De Angelis is licensed under a Creative Commons Attribution-ShareAlike 4.0 International License.